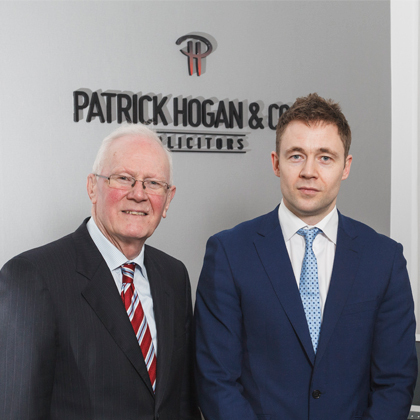 PATRICK HOGAN & CO. have over 70 years of experience and knowledge of the processes involved in the purchase and sale of property and will identify any reliefs available to you. We believe it is important you know the steps involved in a purchase or sale as well as your costs. Central to our offering are affordable fees at fixed rates. 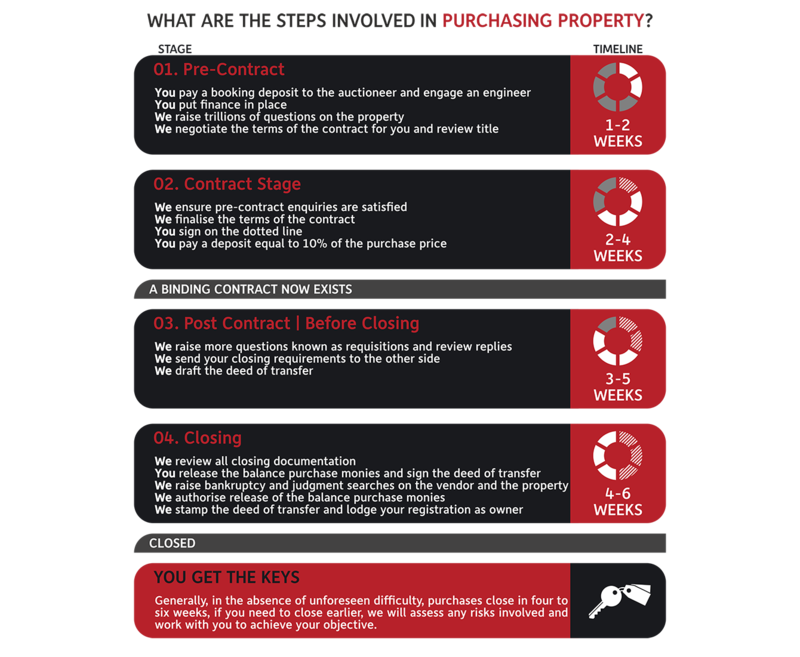 While there is no legal requirement that a transfer, mortgage, sale or purchase follow a particular format, market practice for conveyancing transactions generally involves the stages highlighted below. 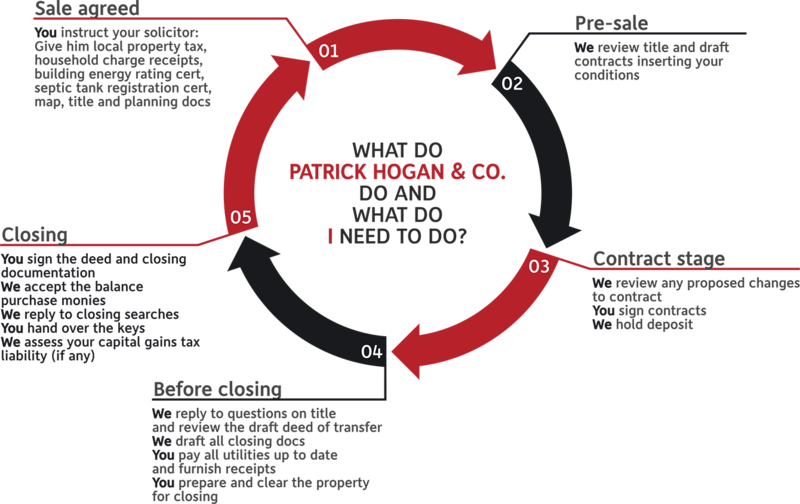 Throughout each stage of the process PATRICK HOGAN & CO. will identify and reduce risk to ensure you are properly protected. The day you buy is the day you sell! Therefore we make certain we obtain all title proofs and documentation you need for closing the transaction on your terms. Clear, flexible and transparent billing practices are fundamental to our service including fixed fees for purchases and sales of property. Selling your home/property is a major financial decision. In order to sell your property you need to instruct a quality solicitor to review title to the property, identify any taxes/reliefs applicable and draft contracts for sale. 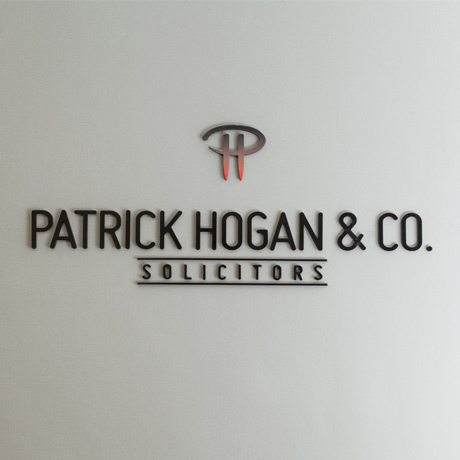 PATRICK HOGAN & CO. will ensure you are suitably advised and protected. We advise you in plain terms and draft contracts on your behalf that reflect any special conditions you have or factors unique to the sale with a view to reducing any risk to you. We will update you at each stage of the sale and offer you affordable fees at fixed rates.